Cocktail: The Chia Fresca – eating my way through Charm City! Have you ever thought, “hmm… I wonder if that could go in a cocktail”? I thought just that when I saw the chia seeds in my pantry. I haven’t been making many smoothies, so they have been sitting for a few months. Pour everything into a shaker, added ice and shake for about a minute. Garnish with a spoonful of the hydrated chia seeds. I happened to have white chia – which doesn’t add much to the color of the dish. If you’re thinking of trying this – hydrate your chia seeds (4:1 chia:water) for ten or so minutes so they get that little bit thicker gooey texture. Next time, I would skip the salt and rim a section of the glass. 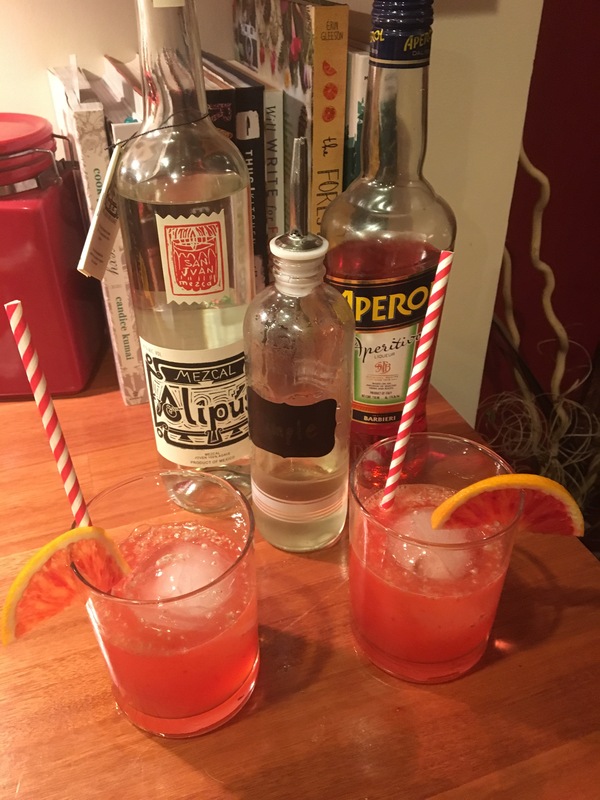 The aperol and the blood orange gives this cocktail a beautiful color. I haven’t had the pleasure of trying the original, but I loved the balance of this one. Definitely smokey, but not too sweet. This entry was posted in Charm City, Drinks, Mezcal, Shaken, What Am I Drinking?. Bookmark the permalink.